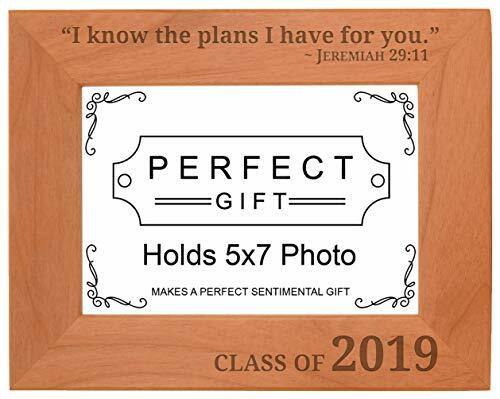 An inspirational graduation gift for a Class of 2019 graduate. This beautifully engraved picture frame makes a stunning gift for any occasion. Frame includes a glass front and can be hung or stood with built in easel and hook. Frame is designed and engraved in the USA. Each frame is made from real wood, and will have its own unique coloration and wood grain pattern. Therefore, product may vary slightly in appearance from image shown. An inspirational graduation gift for a Class of 2019 graduate. You have chosen a 5 inch by 7 inch landscape (horizontal) photo frame. Engraving and frame color may vary slightly, as each piece of wood is unique. If you have any questions about this product by Personalized Gifts, contact us by completing and submitting the form below. If you are looking for a specif part number, please include it with your message.